The Gabriel Safari HDP is a genuine robust, technologically advanced, big bore shock absorber specifically designed and manufactured in South Africa to cater for the heavy-duty performance requirements of today’s SUV, 4x4 and light commercial applications. 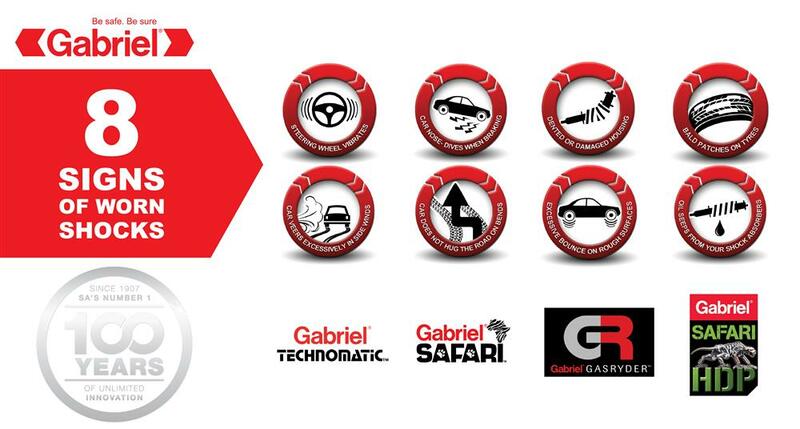 Allowing for greater ride control and increased comfort over other comparative shock absorbers in the market, the Gabriel Safari HDP and its 3 year unlimited kilometer warranty delivers up to its historical Gabriel pedigree and also sets a new standard for performance based shock absorber applications. This change happens gradually over a period of time and drivers gradually adjust their driving to compensate for the extra roll or bounce. A worn shock will reduce the driver’s ability to control the vehicle. Gabriel recommends that you replace your shocks every 60 000 kilometers. When last did you check yours? Worn shocks can cause excessive spring movement of the vehicle, making the vehicle difficult to handle. Worn shocks also affect brake control, reduce the efficiency of Anti-Lock Braking Systems (ABS) and Electronic Stability Control (ESP) and can cause the car to sway dangerously. Shock absorbers that are in good a condition are not only a necessity for proper car handling, but become especially important in emergency manoeuvres. Worn shocks won’t keep your wheels in contact with the road, no matter how new your tyres are. On wet roads, even with good tyres, worn shocks can cause the tyres to bounce and loose grip. At best, road handling is poor in wet weather. Worn shocks require a longer stopping distance and also mean less control when cornering or caught in a cross wind. A worn or damaged shock absorber can cause tyre wear and damage to the suspension. Worn shocks cause the tyre to bounce, creating worn or bald spots, which accelerate tyre wear and reduce tyre life. Excessive spring movement on the vehicle will not only make the vehicle more difficult to handle but can also cause suspension and steering components to wear-out more quickly because of the extra movement to the suspension. Good shocks not only enhance safety and performance but also comfort by providing a smoother ride. A road surface isn’t smooth and the wheels of a vehicle are inclined to bounce over the bumps. Shock absorbers dampen the road shock and prevent the wheels bouncing by keeping the tyre in contact with the road surface under all conditions. A professional shock test takes just a few minutes and can be done at most major fitment centres. This will provide a thorough inspection of the vehicle’s ride control. The extra large big bore working cylinder will reduce the stress on the working components of the shock absorber thereby increasing the durability of the shock. The high temperature oil infused with Nitrogen gas allows the shock to effectively operate at higher temperatures (180ºC) as encountered in severe off-road and loading conditions. Normal oil operates effectively at 120 ºC. Infusing nitrogen gas enhances quicker shock absorber response times, greater vehicle control and ride comfort. The new polyurethane / rubber mounting bushes considerably reduce wear and tear. The Teflon insert between the rod guide and the rod significantly reduces the friction between the rod and the rod guide. The new hydraulic stop lock cushions any metal to metal contact inside the shock under full extension. The new cast iron piston ring is much more durable in high operating temperatures than the alternative Teflon type rings. The full 360º reinforce welded mounts adds significant strength to the mounting points of the shock absorber. SUV, 4×4 and light commercial applications.